How do I ship dry ice with FedEx? First, make sure you have the proper packaging. FedEx recommends using good quality fiberboard (corrugated cardboard), plastic, or wooden boxes. Do not use steel drums or jerricans, as they do not provide proper ventilation for the dry ice inside. Then, make sure you insulate the box with a layer of styrofoam, but DO NOT arrange the styrofoam to form an airtight seal. Dry ice releases carbon dioxide that builds up and could rupture or explode the box if it’s airtight. Once it’s properly packed and marked, slap the shipping label on the package and it’s ready to be picked up by FedEx. 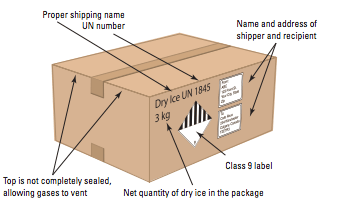 Remember to set the dry_ice_weight string with the exact weight of the dry ice in kilograms on your EasyPost API. You can read more extensive dry ice pacakging guidelines here. Final note: do not use more than 200kg of dry ice.